The professional Mac email messenger. Mailings is a mature high-performance mail delivery app for sending personalized email messages to large groups of contacts. For business or personal use, Mailings is capable of sending thousands of messages, or just a hundred, directly and privately from your own Mac. 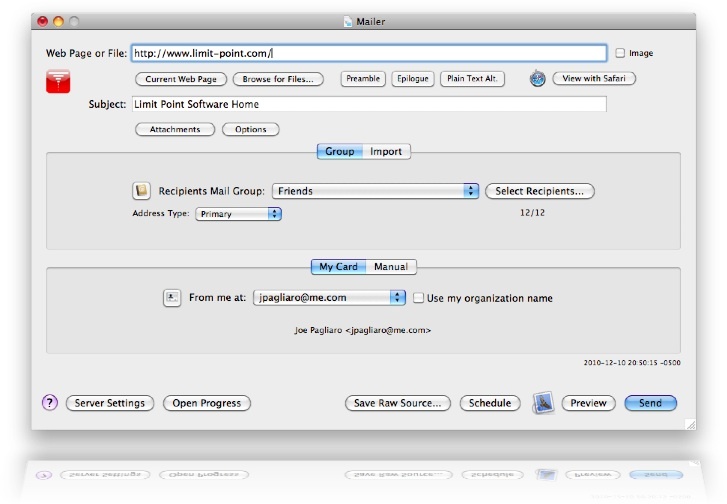 In other words Mailings is a bulk email app for the Mac! What can Mailings do for me? Keep in touch with friends and family. Connect with your customers. Spread news of your products and services VIA BULK EMAIL. Track who’s reading with Mailings built-in message tracking. Use Mac OS X Mail’s Stationery to send holiday greetings or special announcements. Mailings is packed with features. Address book support, message monitor, embedded images, secure (SSL) messaging. Send web pages as bulk email and easily import contacts.